Experience The Ritz-Carlton, Almaty as the first true luxury hotel in Kazakhstan, offering unparalleled Ritz-Carlton service in the best location in City on footsteps of the Alatau Mountains with most spacious rooms and suites, restaurants and bars on the upper floors of the Hotel providing quests unique culinary experience and SPA facilities. The Ritz-Carlton, Almaty is the meeting point for all appreciating design and esthetics and brings together people from culture, fashion, design, media, and arts contributing to the reputation of Almaty as an attractive destination both for tourists and business travelers. 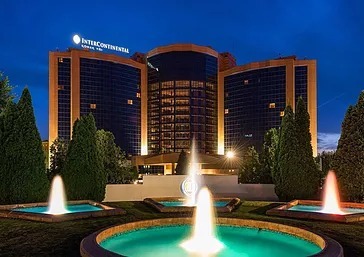 Intercontinental Almaty Hotel opened in 2006 and it attracts visitors with its classical architecture. The hotel lies within 10 minutes’ walk of Kazakhstan Independence Monument, Boluan Sholak International Exhibition and Sports Centre and Central State Museum of Kazakhstan. Enclosed by the palace, the cathedral and museums, the hotel offers a magnificent view over the city. Placed near ski slopes, Intercontinental Almaty Hotel provides a ski pass, ski equipment and ski rental. A 10-minute walk to Abay subway station. The hotel is located within 20 km distance of Almaty airport. 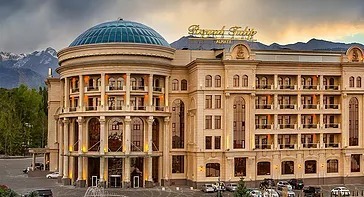 The Rixos Almaty Hotel is the most luxurious and elegant five-star hotel in Central Asia, in a perfect location on the corner of the Kabanbai Batyr and Seifullin streets in the heart of Almaty. 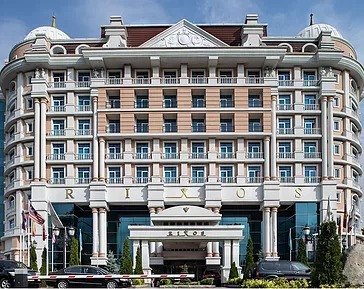 The Rixos Almaty Hotel is a unique combination of cosy accommodation with perfect service, traditional hospitality and individual attention to every guest. You are welcome to enjoy the wide range of our extra services and amenities from high-speed wi-fi, to multifunctional conference halls, concierge service and much more. Offering comfort, quality and great value for its rates, Rixos Almaty is the ideal home to both leisure and business travellers. 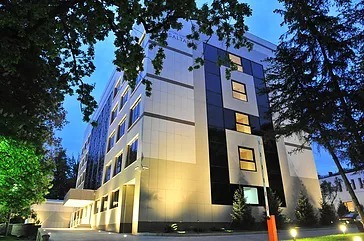 The Royal Tulip Almaty offers 5 star hotel rooms and is ideally located in southern Almaty. This luxurious hotel will take your breath away with its magnificent classical architecture, modern amenities and stunning mountain views. The hotel is ideally located near the financial district of Almaty, while also being close to the mountains and nearby ski resorts. The hotel’s rooms are some of the most spacious 5 star rooms in Almaty, decorated with austere, opulent furnishings. Our rooms have an ambience of welcoming grandeur. The Royal Tulip Almaty is the ideal base from which to enjoy a truly special visit to Kazakhstan’s biggest city. Outside of your luxury hotel room, the Royal Tulip Almaty has many other facilities for you to enjoy. The beautiful indoor pool is decorated with marble and gold so you can go for a refreshing swim in style. Rahat Palace Hotel is a harmonious combination of eastern luxury, European elegance, art of welcoming guests, hedging them with care and attention. Hospitality is a tradition which remains unchanged and is being enshrined by the Hotel. 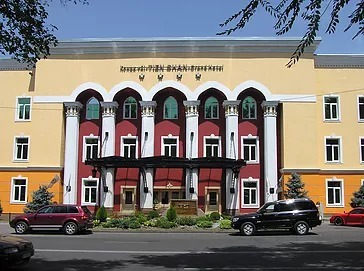 Rahat Palace Hotel in Kazakhstan is situated between the Alatau Mountains and the plains, with most hotel rooms offering spectacular mountain views. The hotel is conveniently located in Almaty city centre and easily accessible from Almaty International Airport. The Rahat Palace Hotel hosts a health club with a spectacular temperature controlled indoor leisure pool, the perfect retreat for your vacation in Almaty, Kazakhstan. Dostyk hotel is the elite and gorgeous district of the city with the spirit and old traditions of the most beautiful city of Kazakhstan. The Dostyk Hotel is located in the so-called “Gold Square” covering some of the most significant quarters of the city. This is the historical center retaining and preserving the spirit of the former Alma-Ata. The Dostyk Hotel, as the architectural monument protected by law, is one of the valuable and unique symbols of such a spirit. Keeping up the best traditions and retaining the breath of the past, currently the Hotel along with the fifth star has obtained a new content by having implemented under the old Dostyk roof a comfortable interior of Century XXI, with involvement of the fascination of the new design freshness and creation of the model of technological perfection. 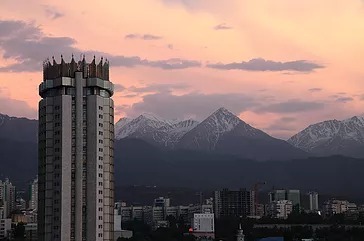 “Tien-Shan” – a modern city hotel opened its doors to guests in 2000, and today offers a full range of services and the highest level of service. It has extensive experience in accommodating guests; the regular guests are universities, sports federations, tourist groups, guests from near and far abroad, and many more visitors of Almaty. Convenient location create additional comfort and a special atmosphere for the guests. 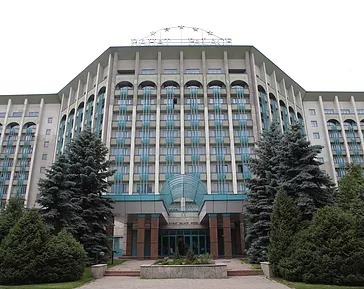 City Hotel “Tien-Shan” is located in the heart of the golden square of Almaty. Within walking distance from the hotel are attractions: the State Academic Opera and Ballet Theatre named after Abay, Ascension Cathedral, Palace of the Republic, Metro station, and shopping. 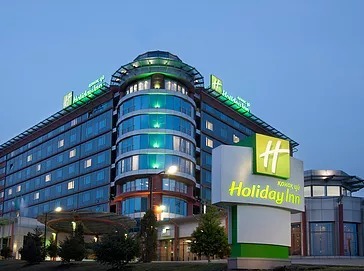 Welcome to Holiday Inn Almaty, the first International mid-scale hotel in the city, is situated in the central business and financial district, only 25 minutes drive from the airport and close to restaurants, bars and shopping areas. The Holiday Inn will provide business travelers and local clients with excellent service and facilities at a competitive price. Situated at the foot of the Tian-Shan Mountains. The Holiday Inn is the closest hotel to the Atakent Exhibition Centre, Almaty’s largest convention centre, hosting most of the city’s major events. For those interested in the history of Kazakhstan, the Central Historical Museum is located close by. 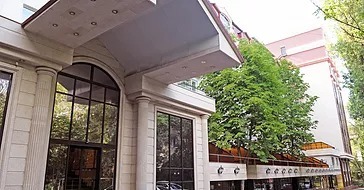 The Worldhotel Saltanat Almaty Hotel, one of the finest Almaty hotels, is located in the historical and cultural heart of the city, just walking distance from the Central State Museum, Republic Square and the Presidential Palace. Hotel is located in the most exclusive district of Almaty city – at Furmanov street, in one area with Reception House shielded from traffic noise by numerous old trees and maintained lawns. 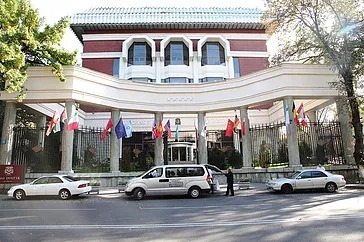 The hotel’s unique location is within walking distance to all main attractions, including the Theatre of Opera and Ballet, the Lermontov Drama Theatre, the National Museum, shopping centers, numerous squares and parks and the famous Kok-tube park, accessible via cable car. Saltanat Residence hotel is right in the heart of the cultural life of Kazakhstan’s southern capital. 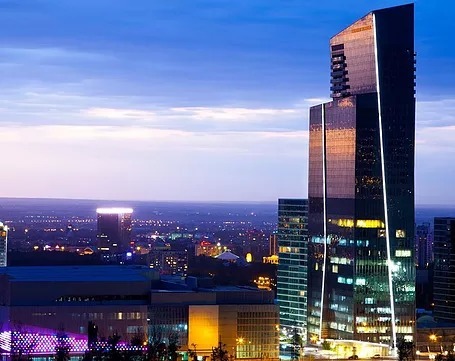 Four-star hotel Kazakhstan – one of the best hotels in its category – is 26-storey building in a beautiful place of Almaty. Splendid view opens from the windows of hotel rooms. Pollution free area where the hotel is located is the heart of business and administrative center in Almaty connected with any point in the city by transport ways. Schools, restaurants, hotels, museums, parks, theatres, monuments are nearby. The on-site Noodles Restaurant serves lunch and dinner. Guests can also enjoy a drink and panoramic city views at BarFly located on 25th floor. Almaty-2 Train Station is 7 km from the Kazakhstan Hotel. Parking is free at the Kazakhstan. 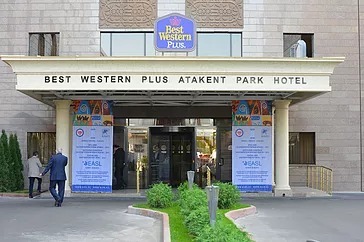 Best Western Plus Atakent Park Hotel is one of the unique places among many hotels and private residences in Almaty. The convenient location of the hotel in the heart of Almaty which is nearby from such sightseeing attractions as Central Republic Square, Almaty Central Stadium, State Museum and Presidential Palace is the main advantage of the hotel. The hotel provides with everything for comfortable accommodation of adults and families with children. Accommodation of quests, management of conferences and a variety of festive events are the most famous services of our hotel. The hotel is a regular attraction for many tourists from all over the world. Located in Almaty, Kazakhstan’s largest city, this modern hotel is a 25-minute drive from Almaty International Airport. It offers free Wi-Fi, indoor swimming pool, spa and traditional Kazakhstani cuisine. All air-conditioned rooms at the Hotel Kazzhol Almaty feature satellite TV, minibar, safe and balcony, offering views of the city. Some rooms offer a flat-screen TV and bathrobes. Room service is also available. A buffet breakfast is served in the Kazzhol’s elegant breakfast room every morning. The hotel restaurant also serves a variety of traditional food from the Almaty region. All meals are cooked with the eco produce. The historic Ascension Cathedral, Abay Opera House and Almaty Central Stadium are all within 4 km from the Kazzhol.